The win completes a redemption story for Cynn, who bubbled the unofficial final table in the 2016 Main Event, just missing a chance to participate in the last November Nine when Gordon Vayo busted him in 11th place. "Feels very different," Cynn said, reflecting on the two results. "I mean really neither is supposed to happen. To make 11th is insane on its own, and to win, that's literally something that you dream of but you just never expect to happen. Right now I do feel pretty overwhelmed." Now Cynn, who has about $300,000 in cashes outside of his two Main Event runs, has cemented a place in poker history and will have a banner adorning the walls of the Amazon Room for as long as the Main Event is still held here. "I do like to think that I don't need the money to be happy, but at the same time it's practically going to make things a lot easier," he said. "Things I want to do in life, things for my family, and my parents. To my parents this is money that they could have never imagined. It'll definitely be life-changing." A heads-up match between Miles and Cynn seemed all but certain since they both came into the final day with a ton of chips while Michael Dyer was short with under 20 big blinds. Dyer got shippy early but his opponents patiently waited, until Miles found the ace-jack and dominated ace-ten, holding up to get it heads-up less than 20 hands in. Michael Dyer watched the final runout of his Main Event. What followed was a heads-up match that turned into a marathon — a test of endurance as much as it was skill. 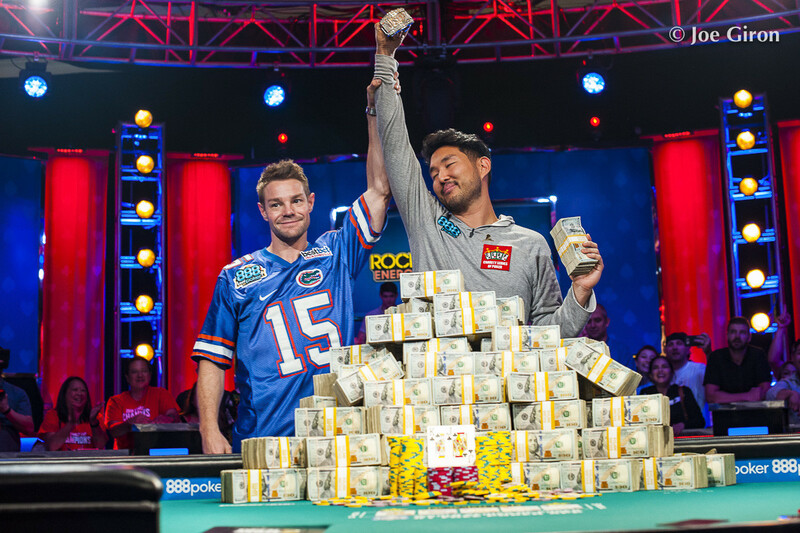 The players battled for over 10 hours across 199 hands, surpassing the highest recorded mark in a WSOP Main Event, set by Vayo and Qui Nguyen in 2016. 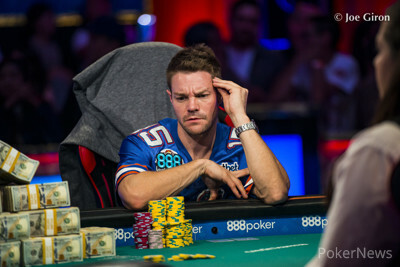 That match proved to be something of a snoozer, with Vayo stubbornly hanging onto a short stack and resisting almost any opportunity to play big-pot poker in hopes of small-balling his less-experienced opponent. Cynn and Miles turned in no such jab-fest. They threw haymakers throughout, trading the lead 11 times. For all of the aggression, neither player had all that many chances to end the match. Early on, Miles overbet shoved the river on a bluff after missing a straight draw. But with three diamonds and a paired board sitting on the felt, Cynn couldn't find a call with just third pair. 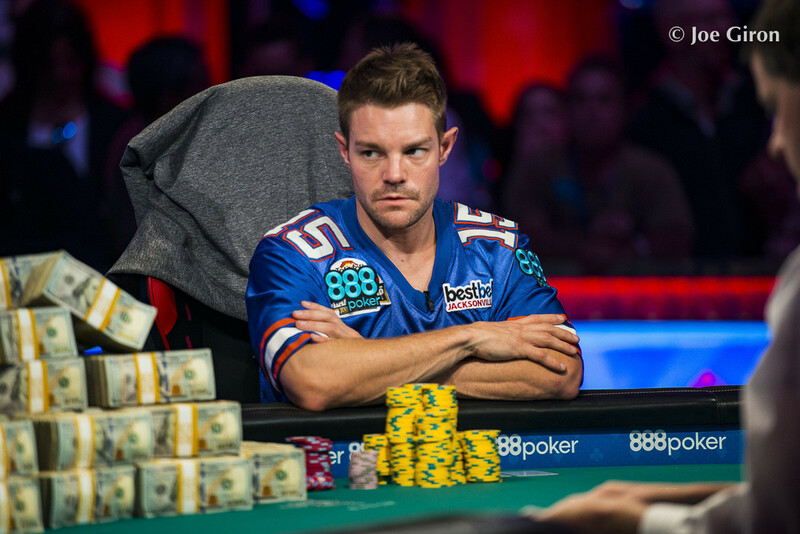 On the 409th hand of the final table, a bizarre all-in pot unfolded wherein both players stuck it in with draws — Miles on an open-ender and Cynn with a gutter plus flush draw. Miles had Cynn high-carded, but as each had seven high on a queen-eight-five flop, a chopped pot looked likely if neither player got there. That's what happened as running jacks hit the board, keeping Miles in the event but denying him a possible double into nearly a 4-1 lead. Miles put up a fierce fight in a 10-hour heads-up match. Finally, just shy of 5 a.m., nearly 12 hours after Day 10 kicked off, the 442nd hand proved to be the finale, and a strangely anticlimactic one. Cynn flopped trip kings and called a flop bet from Miles, who had three-bet preflop. Miles then shoved the turn after pairing his eight but was drawing stone dead when Cynn found a call after thinking briefly. Cynn said the match was unlike any poker experience he's ever had, a surreal experience wherein the stakes he was playing for never entered his mind until the pressure cooker moments. 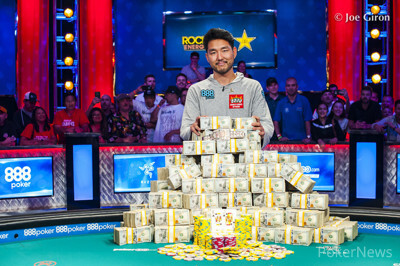 "It was kind of weird because you're playing heads up for the Main, but since we were playing for so long, at some point it just feels like poker," he said. "But then obviously when you're put in pressure spot or when all the money goes in, you realize you know what it's for. You can't compare that to anything else in poker." Both players had loud rails. While Cynn's fans, wearing white "Welcome to Cynn City" shirts, celebrated, Miles' raucous, black-clad supporters, suddenly subdued, filtered to the outer edges of the stage. An emotional Miles joined them moments later after speaking to media, sharing hugs with each individual who stuck around to the finish. Miles called the match a "war." "He's gonna be a great champion and I'm really happy for him," he said. "After the disappointment of losing — which is there is some, I'm gonna be honest — subsides, I'm sure I'll be very happy that I'll be able to help my family and do some traveling and stuff I wanted to do for a long time. It truly is a blessing to be here. I ran way above average just to get to this spot and I'm very grateful." Cynn and Miles shared a rapport throughout the match, and Cynn was complimentary as expected in the aftermath. "Tony is an amazing guy," Cynn said. "I truly belive that from my conversations that we've had at the tables. He plays really well. I think he adjusts well. He put me in a lot of tough spots. "I probably had to adjust during that match three, four, five...I don't even know how many times. And it seemed whenever I would adjust, he would adjust right back. I definitely ran amazing against him." As for where he goes next and what he's going to do with $8.8 million, Cynn declined to commit to anything. Some Main Event champions go the ways of Pius Heinz and Peter Eastgate, all but disappearing into the ether, objects of trivia and idle musings for poker fans and industry observers. Some, like Joe McKeehen and Ryan Riess, stay entrenched as top competitors and graduate on to bigger buy-ins. At least for the immediate future, Cynn's comments indicate he's closer to the former camp. His only goal, he said, is happiness. And while $8.8 million doesn't guarantee that, it certainly opens up many options for the 33-year-old. "I'm pretty exhausted," he said. I think every day somehow you get more exhausted, but also a little bit sharper just because your adrenaline keeps you going, and I think at this point my adrenaline is definitely going. "I think I'm going to try and let my emotions die down before I decide to do anything crazy [with the money]. Probably just get away and disappear somewhere for a while I think sounds nice." 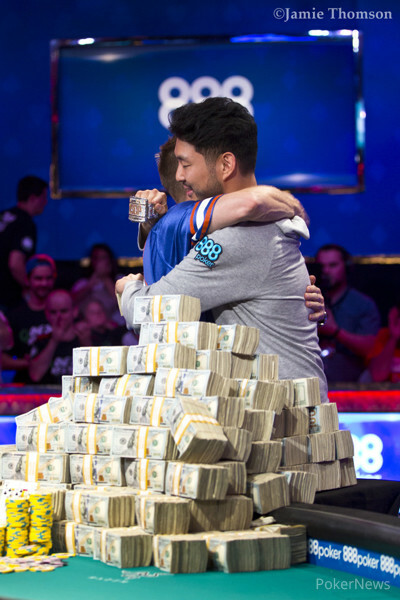 John Cynn won a epic heads up battle against challenger Tony Miles to become the 2018 WSOP Main Event Champion. Hand #437: Tony Miles made it 9 million to go and John Cynn forfeited his big blind. Hand #438: Cynn raised to 9 million and Miles came along to see a flop of . Miles checked and Cynn continued for 9 million, which Miles called. The appeared on the turn and Miles checked again. This time Cynn checked back. On the river, Miles bet 36 million into a pot of 37 million. Cynn called after some consideration and Miles showed for the straight to scoop a decent pot. Hand #439: Miles raised to 11 million and Cynn called, and they headed to a flop. Cynn checked over to Miles who checked back. After the turn, Cynn checked again and Miles made it 16 million to go. Cynn pondered about his decision for a while and folded, sending another pot over to Miles. Hand #440: A walk for Miles. Hand #441: A walk for Cynn. Hand #431: John Cynn received a walk in the big blind. Hand #432: John Cynn raised to 10 million on the button and Tony Miles folded his big blind. Hand #433: John Cynn received another walk in the big blind. Hand #434: John Cynn limped the button and Tony Miles checked his option. They checked down the board where Miles showed , Cynn showed , and they chopped the pot. Hand #435: Tony Miles raised to 8 million from the button, John Cynn three-bet to 26 million from the big blind and Miles folded. Hand #436: John Cynn raised to 9 million from the button, Tony Miles three-bet jammed all in for 99.5 million from the big blind and Cynn folded. Hand #426: John Cynn called and Tony Miles checked, leading to a flop. Miles check-called 5 million. They both checked the and the hit. Miles checked and Cynn checked. Hand #427: Miles opened for 9 million. Cynn mucked. Hand #428: Cynn completed the blind and they saw a for the minimum. They checked to the . Miles checked and Cynn bet 5 million. Miles called and the hit. Miles checked and Cynn bet 13 million. There was a muck by Miles and the pot was pushed to Cynn. Hand #429: Cynn got a walk. Hand #430: Cynn raised to 11 million and won the pot. Hand #421: Tony Miles raised from the button and John Cynn folded his big blind. Hand #422: Tony Miles received a walk in the big blind. Hand #423: Tony Miles raised to 9 million from the button, John Cynn three-bet to 26 million from the big blind, and Miles folded. Hand #424: John Cynn limped from the button and Tony Miles checked his option. They checked down a board of and Cynn won the pot with for a pair of ducks. Hand #425: John Cynn received a walk in the big blind. Hand #417: Tony Miles raised to 10 million and John Cynn came along to the flop. Cynn checked and Miles made it 13 million to go. Cynn called. On the turn, Cynn bet 10.5 million and Miles folded. Hand #418: Cynn limped in and Miles checked to the flop. A check by Miles was followed by a bet of 5 million by Cynn and Miles sent his cards into the muck. Hand #419: Miles raised it up to 10 million and Cynn called. The flop came . Cynn quickly checked and Miles continued for 13 million. Cynn folded and Miles' rail applauded. Hand #420: Cynn limped in and Miles checked. A flop of followed. 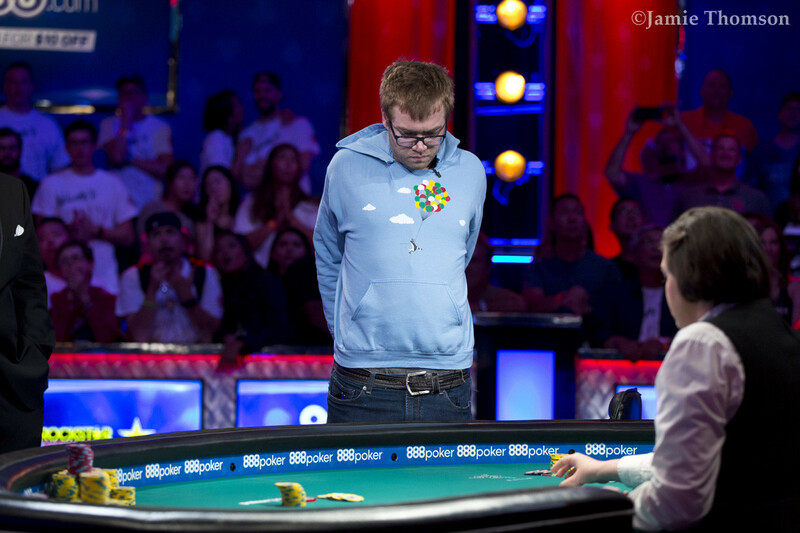 Miles checked and Cynn bet 5 million to force an instant fold from his opponent. Hand #414: John Cynn completed from the button and Tony Miles won by raising to 16 million. Hand #415: Miles opened for 10 million and Cynn called. They saw a flop. Cynn checked and Miles bet 13 million. Cynn peeled to see the turn. Miles barreled for 23 million and Cynn released. Hand #416: Cynn called and Miles once again bumped it to 16 million. Cynn woke up with a reraise to 35 million. Miles mucked.